Gently scratch a line with the almond shaped knife across the wheel’s diameter and down both sides. Turn the wheel over and complete the line across the base. Using the hooked end of the rind cutter, make a 1 cm deep cut all the way around the rind on the scored line. Insert the flat spatula knife completely into the centre of the top line and an almond cutter into one corner. Then insert a second almond knife or alternatively the rind cutter diagonally into the opposite corner pushing the knife handle into a horizontal position. Remove all three knives, turn the cheese over and repeat the process. Remove all the knives and insert two knives in the top of the cheese at either side. Push one knife forward and the other back to ease the wheel apart. 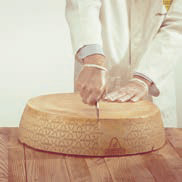 To cut a half wheel into quarters, score a line along the radius of both flat ends and vertically down the side and across the cut cheese. 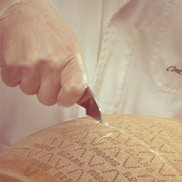 Using the hooked end of the rind cutter or the almond shaped knife, make a cut around the score to a depth of 1,5 cm. Insert the spatula knife into one flat end some 5 cm in from the cut side. Insert an almond knife diagonally into the corner. Remove the blades, turn the cheese over and repeat. Remove the almond knife, then twist the spatula knife to split the cheese. To cut a quarter into eighths, score completely around the rind as before. Ensure the rind is cut to a depth of 1,5 cm. Insert both knives as shown, take out, turn the cheese over and repeat on the base. Remove both knives and plunge the spatula knife into the centre of the cut line. Gently twist to ease the quarters apart. 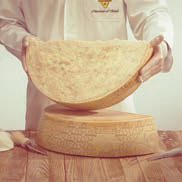 To cut eighths into consumer portions, always score a line around the cheese including through the paste on the cut surface. Make a 1 cm. cut all the way around then with the cheese resting on its flat base, plunge the almond knife into the cheese and gently ease apart. To cut into smaller portions, score around the end of the segment to remove the ‘pointed’ end first. Thereafter divide the segment into two using same method as before, scoring the rind and paste in the same way. Gently easing apart along the cut. Continue to divide wedges into suitable sizes for retailing. Plan your cuts on your best selling weights. Ensure each portion includes a small amount of rind.